These adult-approved Halloween cocktails are guaranteed to make your monster mash a success. From the gross to the sophisticated, this selection of cocktails will satisfy your most picky guests—even your DD. 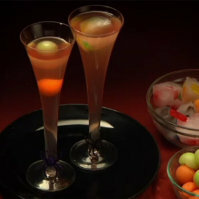 Cast a spell on guests with this bewitching and succulent champagne cocktail. 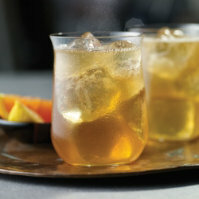 The melon ball garnish and fizzy soda make this a great drink to pair with a dessert. 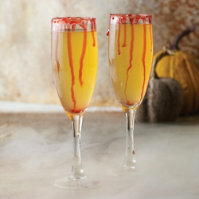 Serve in an elegant champagne flute and make a toast to the spooky night ahead. This sophisticated martini has a bubbly effervescence that plays on the palate. 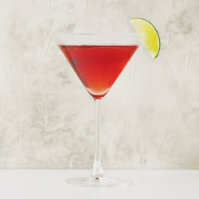 It's a tart and not overly sweet cocktail, which makes it great for sipping through the night. Garnish with a thin lime wedge. It wouldn't be Texas if we didn't add a little spice to our list. We named this drink after the mythical Chupacabra that stalks its prey on Texas farms. 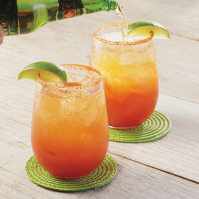 The Chupacabra Bite starts off sweet then strikes with the spice of cayenne pepper. Decorate the rim of the glass with black sugar to make the orange color pop. Perfect non-alcoholic punch you can make ahead. 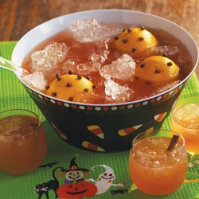 Add in fragrant oranges and cloves for a festively fall refreshment. A sophisticated drink for any party go-er. Channel you inner mixologist and make your very own spicy cider. Add a little kick to your Halloween cocktail list with our recipe for Spicy Spider Elixir. Made with Owl’s Brew The Classic Tea, Agave Wine and a jalapeño garnish. 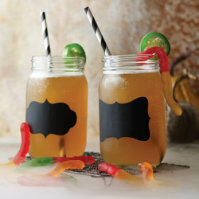 Toss in a gummy worm for a spooky-fun treat. Leave guests spellbound with our recipe for a Bubble, Bubble, Toil and Trouble cocktail made with Owl’s Brew Coco-Lada and El Guitarron Agave Wine. Add some red food coloring for a frighteningly-fun garnish.